Mike Cooper’s 65th Birthday concert at The Red Rose – London U.K. 2007. 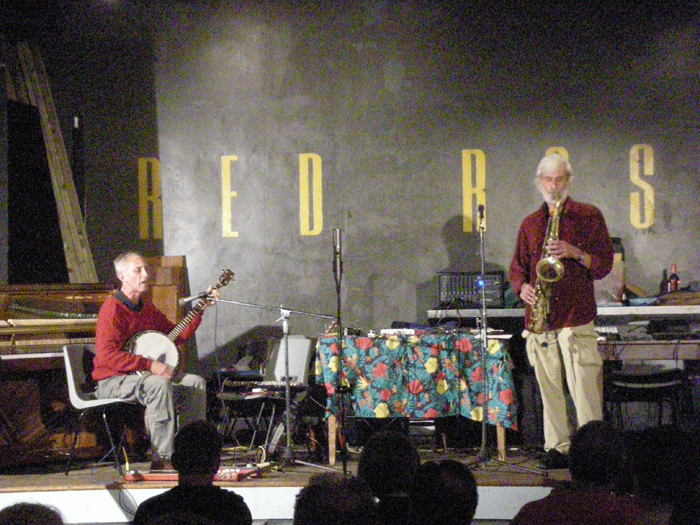 In funny way Mike Cooper’s musical career has been like mine in reverse – he started in traditional folk music and then got the improv. bug, and rejected his roots with records like the extraordinary “‘ave they started yet?” (a duo with the dancer Joanna Pyne on Matchless) which not only rejects the blues and folk tradition, but almost rejects music itself, being one of the most rigorously abstract guitar records I’ve ever heard. From this point he then reached back, taking and reclaiming those parts of the music he started with that he could still work with – whilst simultaneously exploring traditional music from other areas, most noticeably the Pacific. 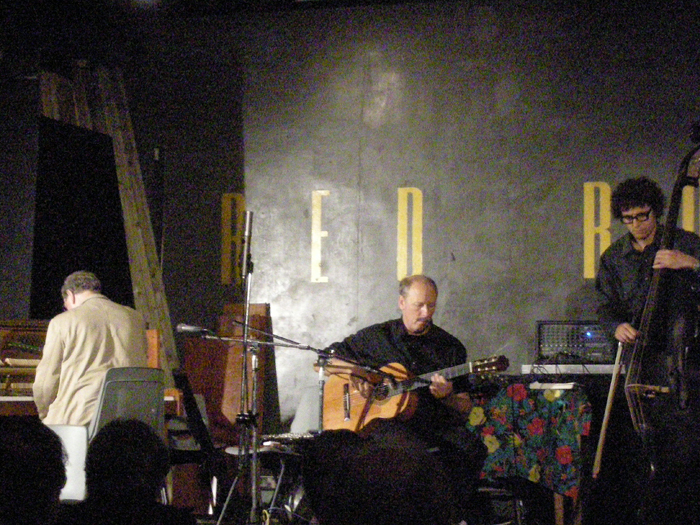 This gig was a celebration of all of this – and the music (and there was a lot) ranged right through the genres – there was plenty of knotty free improv such as a terrific trio of Steve Beresford on piano, Roger Turner on percussion and bassist Joe Williamson. There was some noisy free electronica with Pat Thomas and Cooper on table-top electronics and Turner again clouting and bashing a seemingly random array of objects in a manner as bafflingly musical as it was hilarious. There were several highlights for me – a sustained piece of dusty abstract windswept Americana with Cooper on slide guitar, vocalist Leila Adu being deeply bluesy, and hollowed-out thumping from drummer Fabrizio Spera. Leila Adu had earlier entertained us with the most doom-laden balladry since Jarboe period Swans, so the airiness of this piece was most welcome. 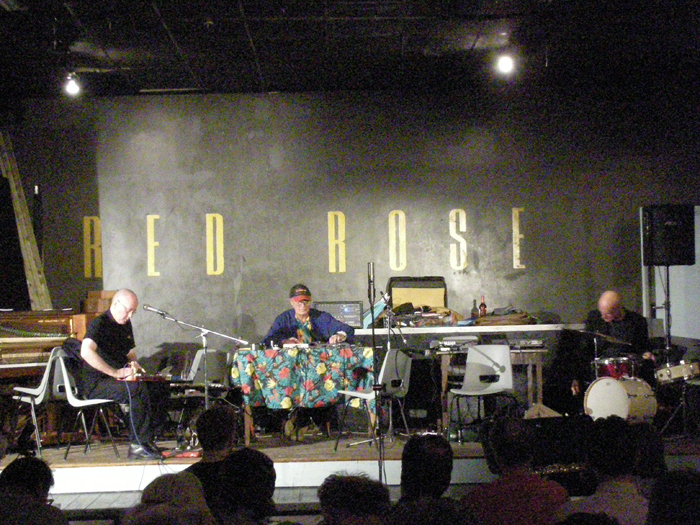 Also of note was a performance by The Recedents – with Lol Coxhill’s place taken by David Toop on lap steel and flute. 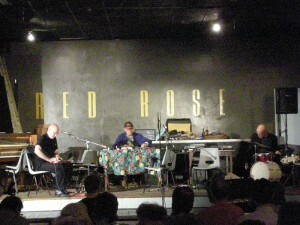 When Toop took up the flute there were echoes of Coxhill’s soprano in the slurring and bending of notes. 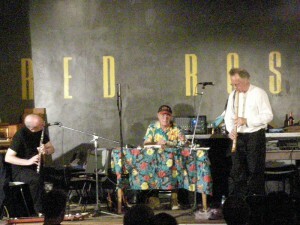 Mike Cooper elected to do all his performances from behind a table with a flowery tablecloth. very tasteful, but slightly disappointing if you wanted to see him actually play the guitar, as it was completely hidden. A musician I’ve never had the pleasure of seeing before was Duck Baker, who did a gorgeously unashamed jazz set with master-bassist-of-all-styles Joe Williamson. 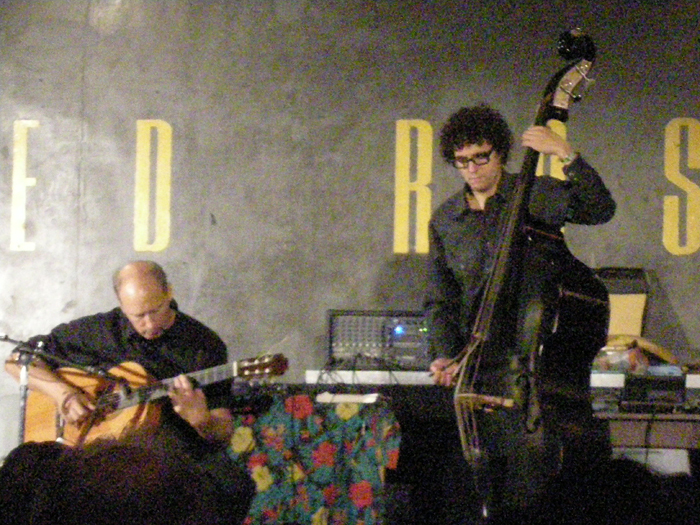 Playing an unamplified acoustic guitar with great fluency and wit, he also did a quartet with Beresford and Spera that was as playful and enjoyable a bit of acoustic improv I’ll see this year. Cooper did a duo with Max Eastley, with Eastley playing that ski-like string instrument he always plays, and Cooper adding some blues vocalising to a droning textured wash of sound. For a notionally free improv gig there were surprisingly few saxophones and only one full on sax-tear up with Cooper, Geoff Hawkins and Tim Hill hitting an Ayler frenzy after a subtle folk blues lead in from Cooper. 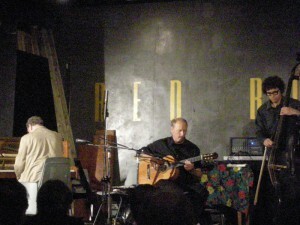 It was also interesting to note some of the musicians who didn’t play – the wonderful accordionist Mike Adcock, and folk guitar god John Rebourn didn’t play, and I’m sure that I wasn’t the only one aware of the fact that all four members of Alterations were present – what a tantalising thought! 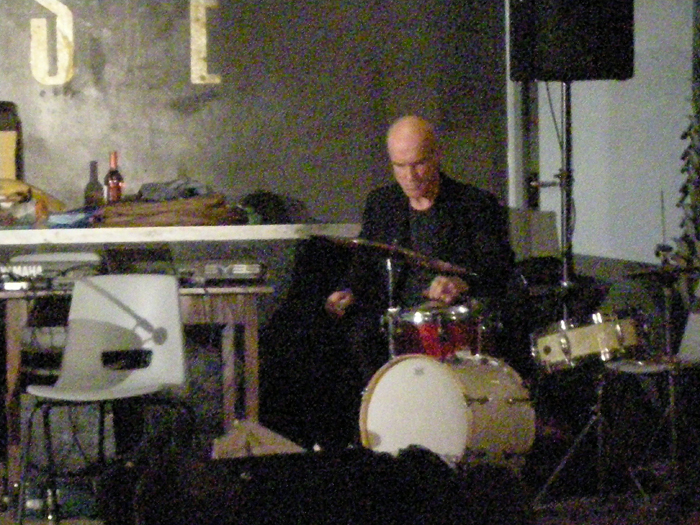 What came across most strongly was Cooper’s openness to all sounds and musics, an openness not always seen in free improvisers. but then there are few that have taken such a unique route as him.